The second biggest eating day of the year in America after Thanksgiving—Super Bowl Sunday—is almost upon us. And unless you’re one of the few sports fans who are shelling out over $5000 a ticket to watch the contest in Minneapolis, you’ll likely be viewing the game from the comfort of your own living room. Whether you’re rooting for the New England Patriots or the Philadelphia Eagles, you’ll want plenty of finger food on hand to stave off the munchies. In past years, we’ve shared lots of Super Bowl-worthy recipes with you, everything from smoked deviled eggs to brownies made with Belgian ale. This year, we’re putting the focus on jalapeno poppers, one of the most popular Super Bowl foods ever. We’re big fans of classic poppers—jalapenos stuffed with cream cheese and grated cheddar, wrapped with a strip of bacon and grilled until the peppers are tender. (See a link to the recipe below.) But there are so many other possibilities. Our first priority was to visualize poppers that would represent the two teams. New England Patriot Poppers: This one was easy. Slice 24 jalapenos in half lengthwise through the stem. Scrape out the seeds and ribs with the edge of a metal spoon. Combine one 6.5 ounce can of drained chopped clams with an 8 ounce package of softened cream cheese, 2 tablespoons of Hellmann’s mayonnaise, 2 teaspoons lemon juice, and 1 teaspoon Worcestershire sauce. Season with salt and pepper. Stuff the peppers with the clam mixture. Set up your grill for indirect grilling and heat to medium. Grill the peppers for about 25 minutes, or until tender. Philadelphia Cheesesteak Poppers: Dice an onion and sauté over medium heat until the onion is caramelized, 10 to 15 minutes. Finely dice 8 ounces of cooked steak or deli roast beef; season with salt and pepper. Stuff the peppers with the meat and top with a few onions. Top with sliced or grated provolone cheese. Set up your grill for indirect grilling and heat to medium. Grill the peppers for about 25 minutes, or until tender. Serve with your favorite steak sauce. 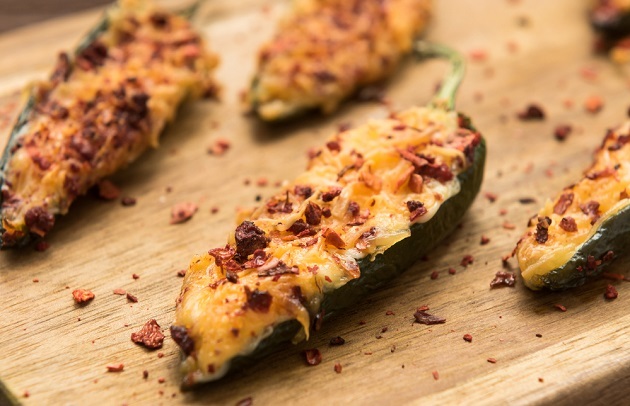 Cheese-Stuffed Bacon Jalapeno Poppers: Smoked cheese takes these poppers over the top. Thai Chicken Curry Poppers: Poppers with an Asian twist. 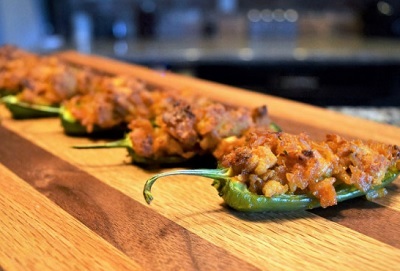 Snow Crab Bacon Poppers: These poppers were inspired by Steven’s home state of Maryland. Fresh corn kernels are a nice addition to the cheese mixture. Do you have a great idea for poppers? Please share it with us on Facebook, Instagram, Twitter, or the Board.